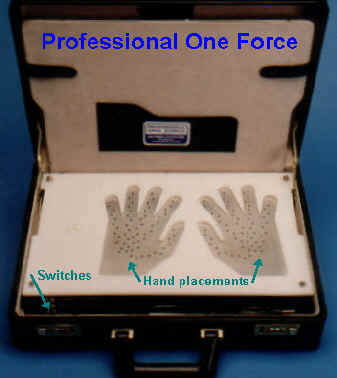 Thought Field Therapy can now be greatly improved by the One Force Inventions. "Dr. Loyd has a practice in Tennessee and became very interested in Danylyk's One Force technology. One of Dr. Loyd's patients had recently had a BodyScan completed, and the results showed her liver as the highest source of stress in her body. (The BodyScan technology by Colorado-based Phazx Corporation, provides a complete computer readout in 65 different categories which shows a person's source of imbalance and disease). "In all cases that I've seen," says Dr. Loyd, "anything that reads out as a top-five problem in the body, such as the liver in this woman, takes a minimum of three months of complete diet change, supplement addition, et al. to show any type of positive change. This woman did not change her diet, her intake of supplements, or anything else, when I used the One Force over her gall bladder and liver. I did this for three successive days for ten minutes and then had her repeat the BodyScan. What was really intriguing to see, was that the liver was no longer a top-five problem. It was now way down on the scale. This type of result is unheard of." Dr. Loyd used the One Force himself, on an old, yet still painful groin and knee injury. "I had pain all the time," Dr. Loyd recounts. The only time I would be free of it was for a few hours after a chiropractic adjustment. When I used the One Force, the pain stopped immediately and didn't come back until the next day and it was only after I applied stress to the area through intense exercise. Dr. Loyd plans to do more controlled studies on applications of the One Force and is sure that it will find its place among the recent advances in treatment. "I don't know quite how this works, but I see that it's working, even on our most difficult patient." Dr. Loyd refers to another patient with "terminal" liver disease who has made tremendous physical, mental and emotional improvements over a three-week treatment period with the One Force." Envy / Jealousy / "Love Pain"
What is the One Force invention? Most people know that acupuncture balances the Chi energy in the meridians. In a similar way, this invention affects all levels of being by an invisible spiritual force which most people can actually feel working on their problems. This invisible spiritual force is established when light from a tiny light bulb interacts with high technology components in the invention. The so-called technology, of how to produce this invisible spiritual force, was given to an engineer by God in a mystical experience. The engineer was told to place this instrument on the market. The invention is not like anything else on the market and has a patent pending. It does not use frequencies, magnets, electromagnetic fields, sound or lasers, but actually an invisible spiritual force produces the wellness on all levels of being. Using the invention is one of the most powerful and healthy steps you can take to achieve total wellness on all levels of being. The results are amazing and profound! Your clients will experiencing amazing results...freedom from all kinds of emotional pain, increased well-being, increased levels of performance in all areas. We have seen people, who smoke 1 pack of cigarettes a day, lose the urge to smoke for many days just from placing their hands on it for 15 minutes! Read the increased levels of performance in all areas. We have seen people, who smoke 1 pack of cigarettes a day, lose the urge to smoke for many days just from placing their hands on it for 15 minutes! Read the 50 testimonials on this web site before forming any opinions.